Thinking back to her time spent in Iceland during a month long residency last year, Tracing PAPER artist Linda Hemmersbach recalls “I felt almost like I was writing a book, even though I wasn’t writing anything.” Far from being unproductive however, the stack of around 200 sheets of paper she arrived with in her rucksack were put to good use. 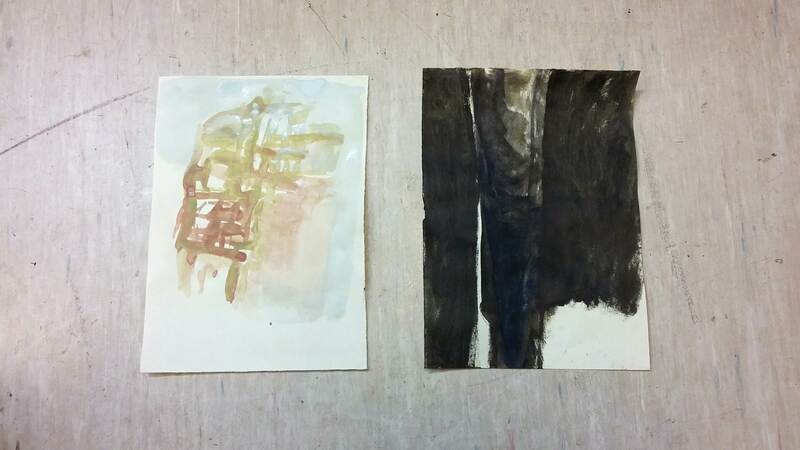 Now pinned to the walls of her studio in Levenshulme they read like a visual diary of fleeting sensations: capturing her experience of the place through colour, texture and shape. As well as the Iceland trip, over the past two years Hemmersbach has also travelled twice to Greece (Athens and the Island of Evia), spent a week in a ‘bothy’ (traditionally a free shelter for travellers) on the Isle of Eigg in Scotland, and explored the Jura Mountains and Lake Geneva in Switzerland, all through residencies. With this context it suddenly becomes quite easy to locate each painting. Of the few she brought back from Greece (finding she mostly preferred to make work directly onto or with the walls of derelict buildings, or with found material such as pieces of marble, which she left behind) there’s a strong sense of earthiness and yellow engulfing heat. The contrast with the more atmospheric tones of the Iceland works – at times characterised by a calm quietness, at others by a sense of brooding which she relates back to an awareness of the geothermal volcanic activity going on beneath – is stark. Paper itself plays an important role. Not only is it very transportable, but its relative cheapness and ubiquity allows Hemmersbach a sense of freedom. “I like to work on lots of different things at the same time and just get ideas out,” she says, contrasting this with her previous oil on canvas paintings and the inhibiting perception of the material’s enhanced ‘worth’. Hemmersbach now makes deliberate efforts to acknowledge and even celebrate the objecthood of her work on paper through the way it’s displayed, adding: “I always enjoy the edges curling.” This is an area she has become increasingly interested in on a broader level as well, exploring the space around the paper as much as within through site-specific installations. Talking of shifts in her practice she mentions her piece January (2015), currently on show at the Walker Art Gallery in Liverpool as part of the John Moores Painting Prize 2016 exhibition. “I submitted it because it came at a breaking point and new beginning in how I make work. It’s very stripped back and modest in size”. The painting emerged from a week spent in Norfolk and was originally presented as part of So Many Constellations, a group show that Hemmersbach curated with her friend and fellow painter Nicholas John Jones at Mayors Parlour Gallery in London. Named after a piece by one of her favourite poets, Paul Celan, the exhibition looked at the relationship between poetry and contemporary painting; a theme she is returning to this year in an expanded form with Crossings (10–24 September) at Bankley Gallery, organised in collaboration with two friends, Hannah Luxton and Fiona Grady. You’ll also have the chance to see Hemmersbach’s paintings exhibited by PAPER at The Manchester Contemporary 2016 (22–25 September) alongside Mali Morris RA and co-Tracing PAPER artist Lisa Denyer, and as part of Tracing PAPER (1 October – 5 November) featuring new work by each of the nine North West based artists participating in PAPER’s 10-month mentoring scheme. Now in its second year, Tracing PAPER is a mentoring scheme that provides professional mentorship, development and critical discourse to artists based in the North West. Nine artists were selected from the 2015-2016 open call, with a diverse range of practices including painting, photography, drawing, and engaged practice.